We often think about the doors to our bath as a workaday shower kit. It opens and closes day in and day out. It takes you in dry and sends you off wet and clean. But there is a reason why hotels, or some people, are very particular with shower doors. The answer is— shower experience. For one, the look of the shower door helps bring a special ambience to your bathroom. A shower atmosphere is a key to a relaxing, refreshing, and reviving bath. Secondly, shower enclosures are not only like a run-of-the-mill gate. The make, material, or structure of the enclosure will tell, for instance, how much water is kept indoors. The amount of heat and moisture in the shower also depends on these styles. Just compare hard doors to shower curtains. You could imagine a ton of differences in terms of shower experience. There’s more to these shower portals, and there are different kinds, too. To choose the best shower doors, you need a guide. 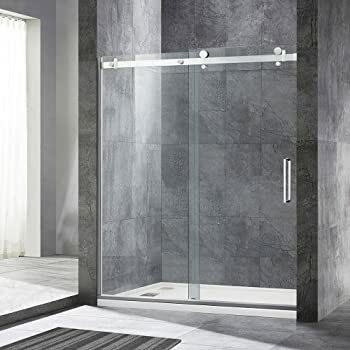 What are available shower door designs? 1 What are available shower door designs? Knowing the different types of shower door designs in the market will ease the burden of making a crucial decision. These shower door styles are inspired by many factors including budget, functionality, space, and upkeep. People’s likes are also taken into account. You might also want to use these factors to narrow down your choices and filter the best shower doors. Budget is not only the primary factor for making purchases. Choosing takes a combination of others that make a buy worthy of the money spent. In terms of utility, think about what door would be good to enclose your bath properly. How far out you want the door open may matter to you, too. Space is also a major deciding factor. 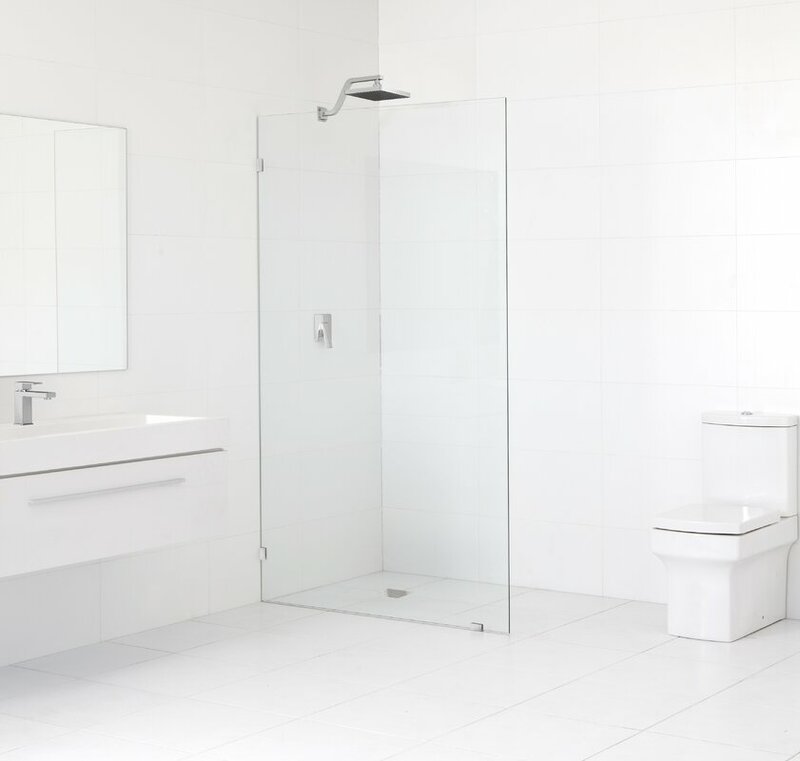 The layout of your bathroom space will tell whether a pivot or sliding door would be apt. Different door types determine upkeep, too. For instance, a door design that keeps the moisture in may need frequent cleaning. When you search for shower or bathtub doors, you will encounter these terms: bypass or sliding, pivot, framed, and frameless doors. Let’s get to know them. They are often called sliding doors. They are so named because they typically roll left or right on tracks attached to the enclosure. Usually, bypass doors have two doors; one is fixed, the other slides off the tracks or is aided with mechanical rollers. This design is popular because sliding doors take up the least amount of space for the door to swing in or out. Bypass doors can be used in both stand-alone showers or bathtubs and bathtub-shower combination bathing spaces. 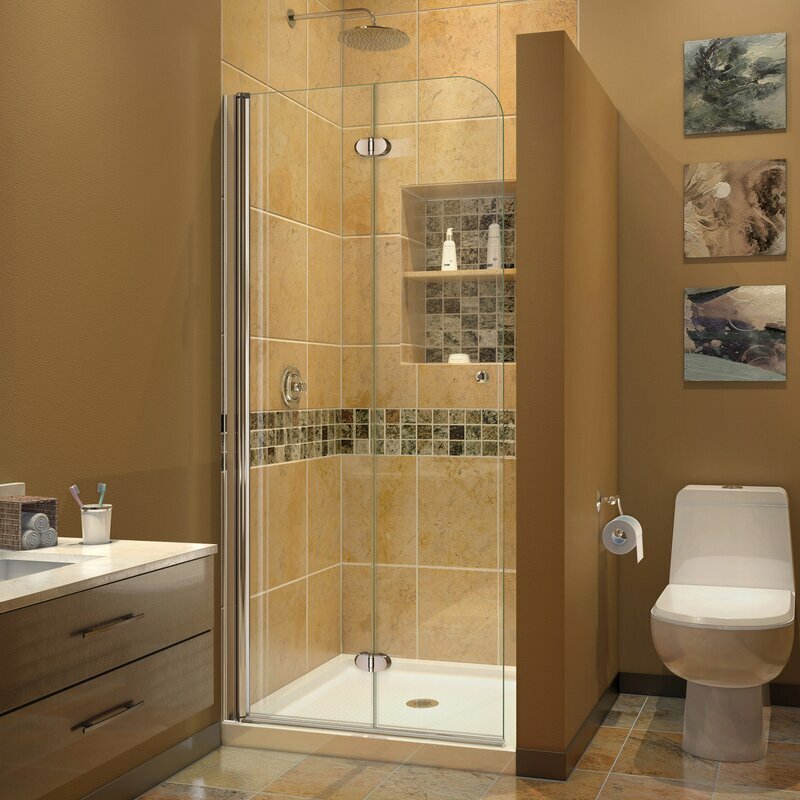 The best sliding shower doors should glide along the top and bottom tracks smoothly and quietly. These doors are often referred to as swing-open doors. Some people call them hinged doors, but they are different. Some sites ascribe a particular design to hinge doors which other sites do to pivot doors. A debate on these terms may ensue, but it is useless here. Just know that pivot or hinged doors can be designed to open outwards and inwards or swing at 180 degrees. That will depend on the type of hinge installed. The hinge can be attached to a fixed glass panel or to a center support which makes a revolving door. This shower door is popular for bathrooms that have a lot of clearance space for the door to swing in or out. While we are on the subject of pivot doors, it is also useful to know about the round types of swing enclosures. Round doors usually swing inwards. A lot of people like round enclosures not only because they look unique but also because they are curved. Since they are curved, they create a larger space for your shower room. Round doors are also usually installed on corner stand-alone showers. Bath screens are installed with several glass panels. That is why they are often called bi-fold or tri-fold doors depending on the number of panels. Such enclosures are usually designed with one fixed glass panel and two doors folding in on hinges. Remember those good old bi-fold closets? These bath screens work the same. People choose bi- or tri-fold doors for the same reason for using them in closets. Bath screens, like sliding doors, use bathroom space efficiently because they do not swing out widely. For those trying to usurp small spaces, neo-angle shower doors are perfect. They are usually used for corner shower rooms. Neo-angle doors are usually installed with two smaller side panels that stand perpendicular to the bathroom walls. Between these panels is the door that usually opens outwards. A design like this gives the bathroom a focal point and a roomy bathing space. This type of doors is particularly called so because they intend to keep the steam inside the shower room. Installation is steam tight on all seams and from floor to ceiling. It allows the shower room to double as a steam area, a bit like a sauna, if you like. Steam doors are often set up with glass panels. A hinged door is attached to one of these glass panels with an air-tight seal. In most designs, moveable panels are installed on the topmost part of the enclosure. Called transoms, these moving panels act as air vents. Both framed and frameless shower doors are categorically based on how they are attached. Framed doors are usually made with aluminum sides or from other composite materials. You will see in many ads that they are coated or finished. There is brushed or matte nickel finish, bright silver, or bronze. Characteristic of framed doors is the presence of tracks. They usually collect water, so it might need frequent cleaning. Framed doors are usually more affordable. They may not appeal so much to a modern look, but they are sturdy. Thanks to the aluminum frame that gives support. Frameless doors look more modern than the framed ones. They look simple, clean, and sleek. Owing to these traits, they help showcase an artsy tilework in the bathroom. They also render a roomy sense of space to the bathroom. The best frameless shower doors are made with a sturdy, tempered glass which makes frames redundant. Usually, they are installed without metal tracking and support except for some hinges. Some doors under this type have metal frames on top or bottom, or on some sides. They are called semi-frameless doors. Owing mostly perhaps to its aesthetic appeal, this type of doors often cost twice as much as the framed ones. Be also informed about the glass material used for shower doors. The best glass shower doors are not made of just regular glass. They must be tempered. Glass that is tempered is more durable and react differently to breakage than the regular glass. Shower doors that are certified tempered are better. Don’t go skimpy on them because you deserve the safest. You will also find terms like clear or frosted glass. There are patterned ones too. The choice depends on your personal need or style. This unique glass panel does not have a sliding or pivoting door. It is installed mainly to serve as a bath screen. It features a coated frameless glass that creates a clean and spacious look to the bathroom. The glass is treated with Enduroshield, which repels water, soap scum, and grime. It also protects the glass from limescale and hard water stains. 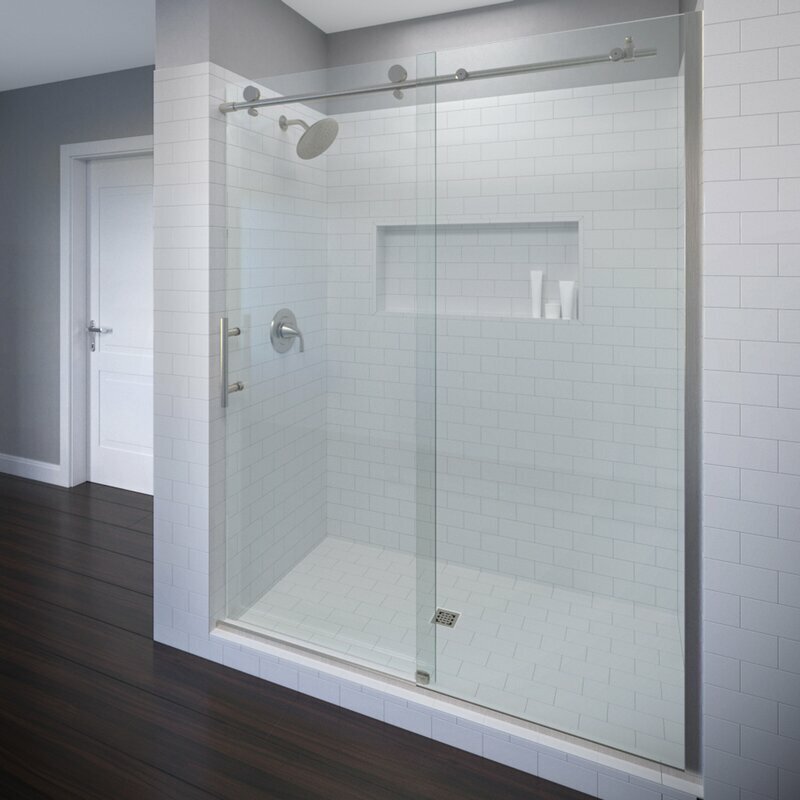 This shower door by LessCare features a clear frameless enclosure. It opens through a single-sliding door with brushed nickel-finished handle. The glass is tempered, which makes it sturdy. The aluminum metal strip on top adds to the strength of the door. It also creates a modern and sleek appeal. The frameless design of this Vinesse single sliding door by Basco renders an apparent large space. It shows an unobstructed view of the artsy tilework of the bathroom. The enclosure consists of a fixed glass panel and a sliding door. The glass panels are lined with metal on top that can serve as a hanger. Other metal accessories are made of anodized aluminum. This door is designed to make installation flexible to the needs of customers. 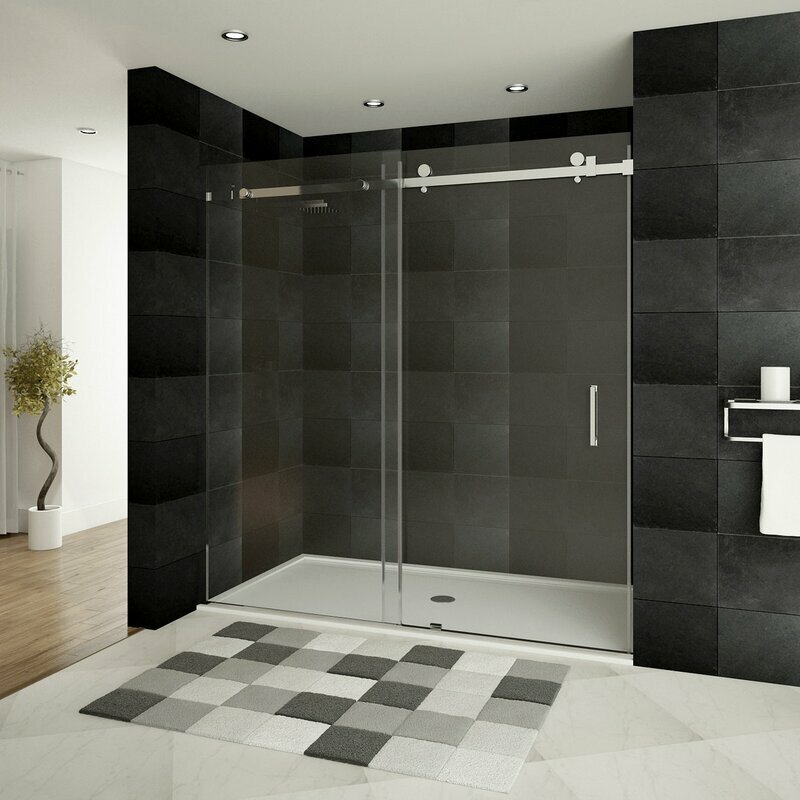 Featuring a modern design with a European flare, this shower door has a unique trackless bi-fold design. It allows wide entry without taking space for the door to swing out. This bath screen door is perfect for narrow entrances where neither sliding nor swing doors fit. It is equipped with a 6-mm clear tempered glass. Attached with anodized aluminum hinges, the glass is curved to elegance. 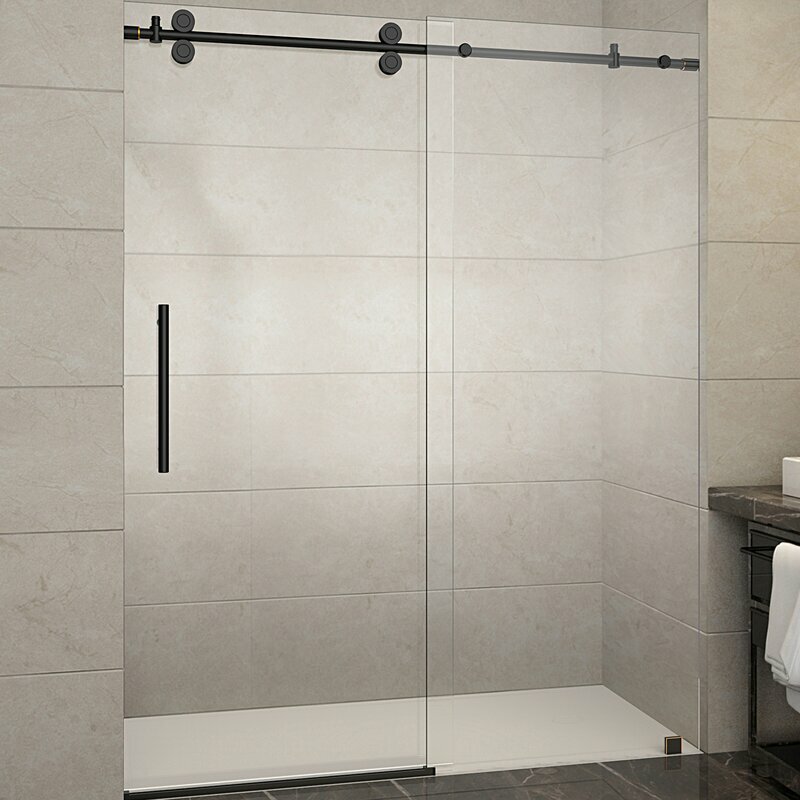 Certified by ANSI, this tempered frameless glass shower door is robust and resilient. With the choice of either clear or frosted, this glass kit fits a modern bathroom design. The door is attached with metal rails made from stainless steel. The rails are built to withstand even a heavier glass material. They are made with adjustable Vigo’s Roller Disk Technology. This flexible mechanism will ensure that the door fits the space. It makes installation a breeze, too. 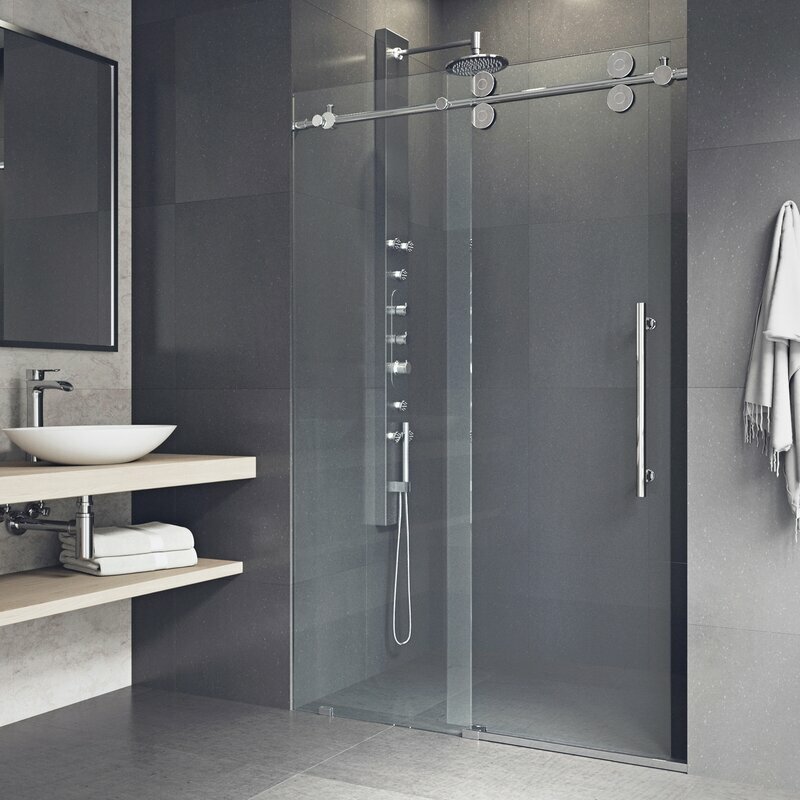 The bypass design of the Langham shower door fits either a wide or narrow bathroom space. It is so designed to fit either left or right entry. For its metal attachments, you have a choice to get a chrome, stainless steel, or oil-rubbed bronze finish. Its 10-mm glass is tempered. You can choose between clear or frosted types. Levity’s design features full sliding glass panels. 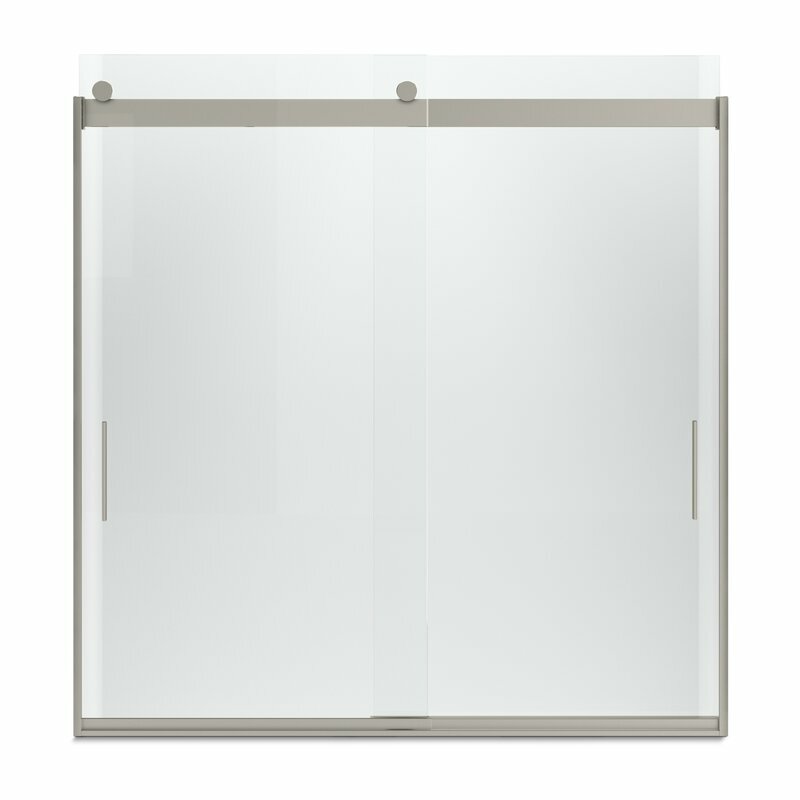 Featuring a minimalist frameless design, you can not go wrong with this bypass glass door. Glass is tempered and coated with CleanCoat glass treatment. The center of the enclosure is cushioned. Cushioned center provides quiet sliding action. This glass door by Woodridge features a 7-mm ANSI-certified tempered material. It is equipped with top rail support to stabilize wall anchorage. Stainless steel hardware adds to the modern look and rust protection. 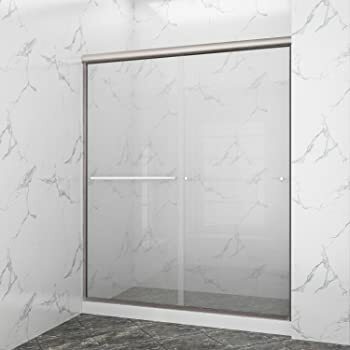 The glass in this semi-frameless sliding shower door is not only ANSI-certified tempered. It is also treated with a spot guard glass coating. This enclosure is installed with a track assembly kit crafted from anodized aluminum. Its Trinsic handle can double as a convenient towel hanger. This two-way bypass door is made with tempered glass and hardware with brushed nickel finish. It is easy to install and reversible for left or right entry. The bottom track requires less maintenance as it is easy to clean. 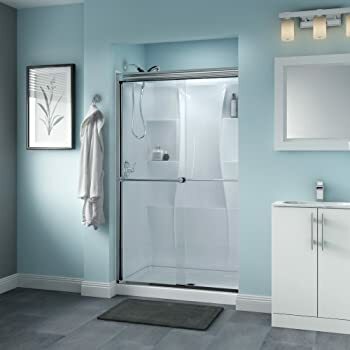 Among the top ten shower doors featured above, the Langham Single Sliding Frameless Reversible Shower Door By Aston emerged as a worthy choice for your buck. Its price can be a bit steep knowing that it takes a frameless design. However, in terms of upkeep, it is assembled with the needed trappings to make it durable and low-maintenance. First, it has certification from the American National Standards Institute. Because it is frameless, the brand makes sure that the glass is sturdy. Among the reviewed doors, Aston Langham Sliding Shower Door has the thickest glass. Most importantly, the enclosure prevents water leaks, which is often why shower doors are built. Choosing the best shower doors must be given serious thought. They are almost permanent and costly fixtures. Not only that, knowledge of how certain door qualities relate to bathing experience is vital.